NACCE provides leadership and sustainable, scalable resources to foster entrepreneurial thinking and action in one of the largest entrepreneurial ecosystems in the North America. The association represents 2,000 faculty, staff, administrators and presidents who serve more than three million students. We welcome carefully planned partnerships and sponsorships with corporations, non-profit groups and foundations that share our commitment to entrepreneurship in community colleges. Several options are available for your organization to enhance awareness among our administrators, college presidents, faculty and trustees. Member colleges benefit most from year-round key partnerships that create pathways to entrepreneurship and learning. Find out how your organization can partner with NACCE to pioneer new learning initiatives. Contact Leah Deppert, Manager of Marketing & Communications, to learn more about year-round pilot program and revenue share partnerships. Contact Leah Deppert, Manager of Marketing & Communications, to learn more about sponsorship opportunities. Get your message in front of NACCE members. Learn more about advertising opportunities in NACCE's print publications and E-news. 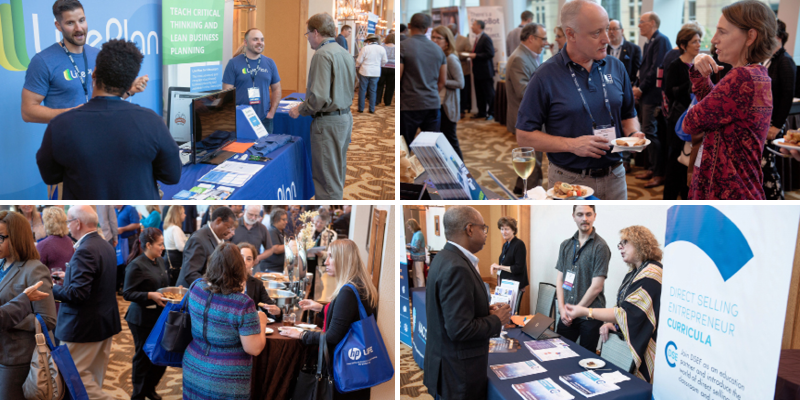 NACCE offers a range of opportunities to reach and build brand awareness with our 300+ community college members representing 2,000 decision makers. The following lists the marketing assets and their individual prices. Depending on your marketing and sales goals, it is suggested that you buy a bundle of assets and/or engage with our audience consistently over time. Community College Entrepreneurship is NACCE's journal of best practices and industry insights that is published four times a year for our community college members. It is directly mailed to our 2,000 members representing 300+ community colleges. It is distributed at national and regional events. The journals are also available electronically. Download the latest issue here. Our bi-monthly curated eNews keeps our members with their finger on the pulse of innovative solutions on community colleges campuses and in entrepreneurial ecosystems across the country. Sent every other Tuesday, the eNews features a main article on teaching entrepreneurship or entrepreneurial ways to solve common community college challenges, reports from the entrepreneurial ecosystem, member news and what we are sharing around NACCE. To sign up to receive our monthly non-member or sponsor/partner enewsletter, please click here. Each eNews article and banner are also posted on NACCE’s Facebook and Twitter. Contact Leah Deppert, Manager of Marketing & Communications, to learn more about advertising opportunities.